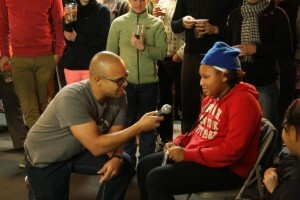 Home » Blog » Sneak Peek raises $12,880! On Wednesday night, dedicated and enthused volunteers, friends and supporters braved the cold and joined us at the 4th annual Holiday Bike Drive Sneak Peek at our bike shop. Warmed with twinkly lights, a Metrofiets’ beer bike and sandwiches galore, we had one of the most successful events to date. As rosy-cheeked guests enjoyed a plentiful array of food and drinks, photos from last year’s Holiday Bike Drive reminded us of what’s in store for the big event on Sunday. We were very lucky to meet an amazing family who has participated in many of our programs. Nicole Craine is a community organizer at New Columbia and went through our Create a Commuter program, her daughter Ayzha participated in Bike Club and her son Antoine is earning a bike at Holiday Bike Drive this week. Their story really highlights the incredible impact the bicycle can have when the whole family is connected and can ride together. Staff and volunteers also shared stories about Holiday Bike Drive and why the Community Cycling Center matters in their life. With their encouragement and the incredible generosity of the entire crowd, we raised $12,880 in one evening – which is amazing! Thank you to everyone who joined us and who made this evening such a success. If you couldn’t make it out to the Sneak Peek but would still like to make a gift, you can do that quickly and easily by clicking here. We still have $100,095.41 to raise by December 31st to meet our goal of $147,000! We would like to give a special thanks the Raymond Family Foundation and New Seasons for sponsoring the event.